The Bradley also was modified to provide a battle command vehicle (BCV) for use by task force, battalion, and brigade commanders. Battle experience during Operation Desert Storm (ODS) clearly indicated the need for such a vehicle that would provide the commanders the protected mobility required to operate with the fast moving combined arms units. 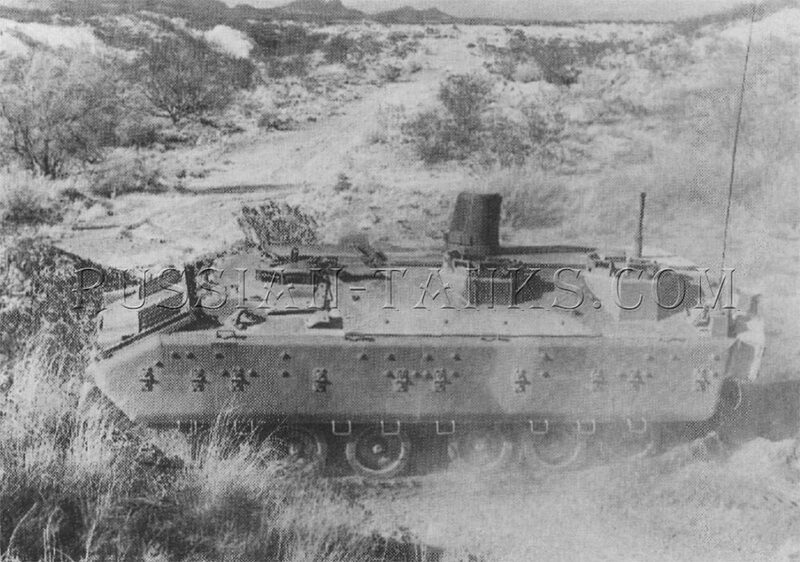 The external appearance of the BCV was identical to that of the -A20DS Bradley except for the additional antennas required for the communications equipment. In addition to the vehicle crew, the BCV carried the commander and a small staff of up to three officers. These could be operations, fire support, intelligence, air liaison, or logistics officers depending upon the particular mission requirements. The BCV retained its full armament of the 25mm M242 cannon and coaxial machine gun as well as the TOW missile launcher. However, the ammunition supply was reduced to provide space inside the vehicle. The M981 FIST-V based upon the M113 series armored personnel carrier provided essential field artillery support for the maneuver forces. With the introduction of the M1 main battle tank and the Bradley fighting vehicle, it was obvious that a new fire support team vehicle with comparable performance was required. 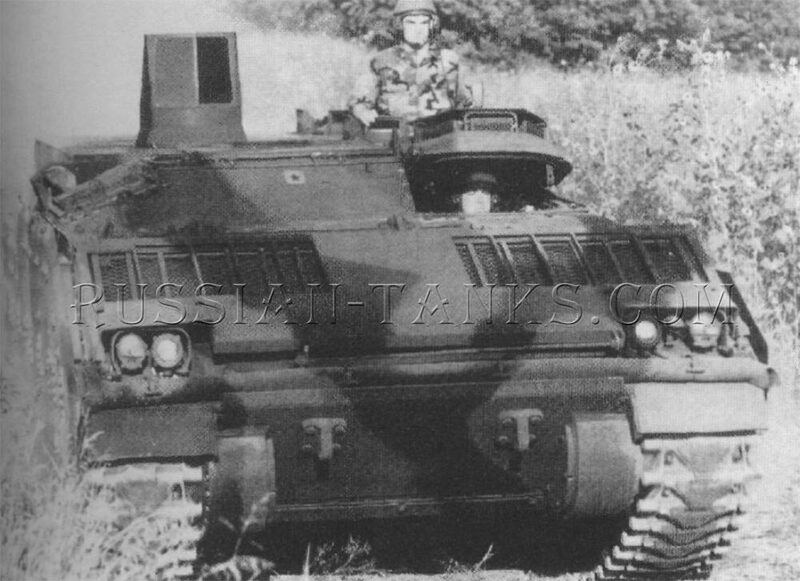 Such a vehicle, designated as the XM7 FIST-V was built by United Defense based Upon the Bradley -A20DS. 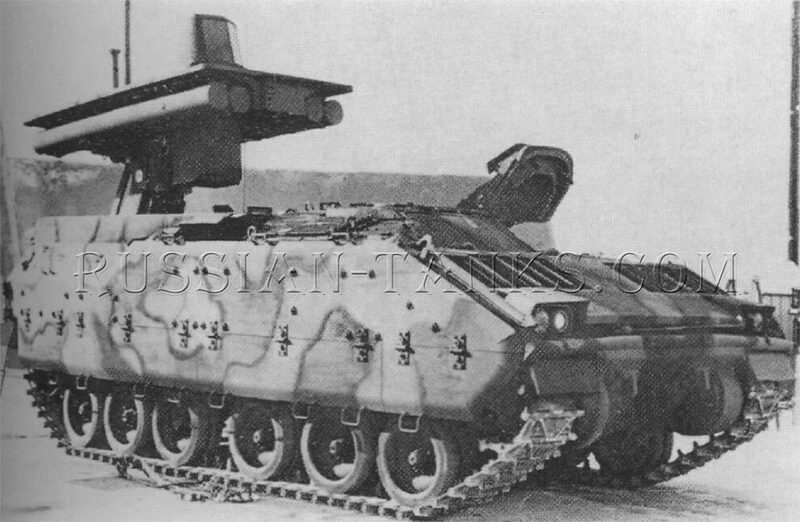 The XM7 was equipped with the AN/TVQ-2 ground vehicle laser locator designator, the AN/TAS-4 TOW night sight, and an inertial navigation system. The armored enclosure normally used for the TOW missile launcher was modified to house the FIST equipment except for the SINCGARS radios. The 25mm M242 camion and the coaxial 7.62mm machine gun were retained for self-defense. 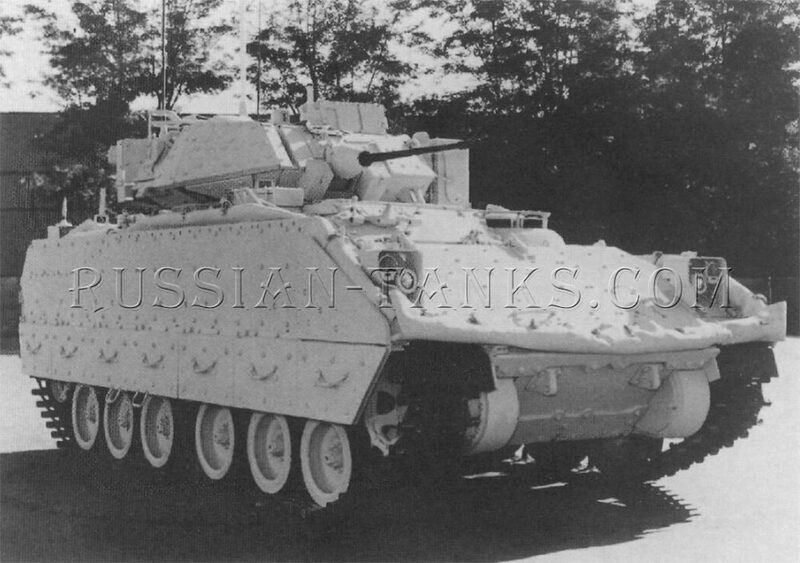 A further development of the FIST-V vehicle based upon the -A3 Bradley was assigned the designation XM7A1. 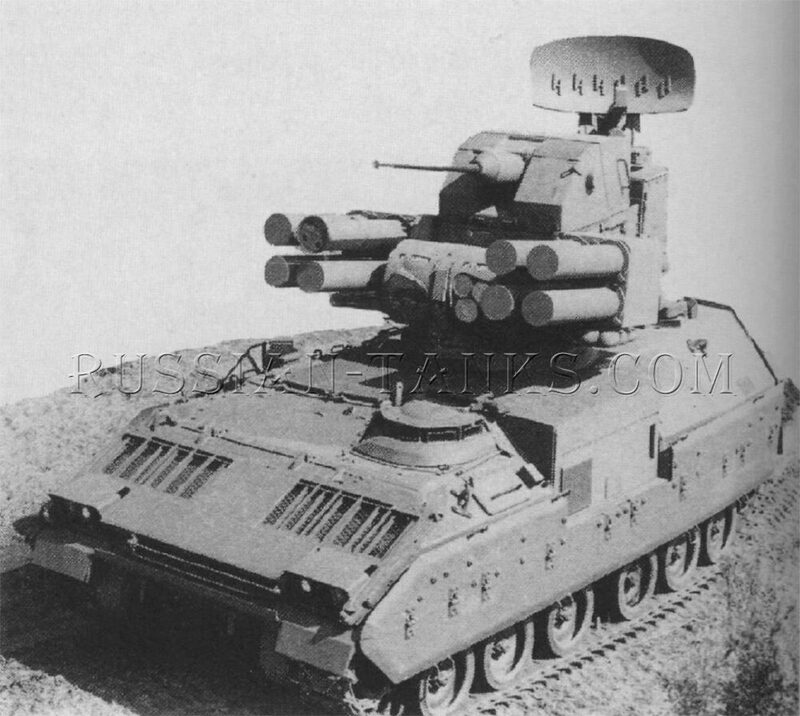 The Bradley turret vehicle was considered as a carrier for the kinetic energy missile (КЕМ). The КЕМ, also referred to as the hypervelocity missile, was not fitted with an explosive warhead, but depended upon a heavy metal penetrator rod moving at about 5,000 feet per second to destroy the target. The rocket system propelled, beam riding, missile was about 6.4 inches in diameter, 113 inches long, and weighed approximately 170 pounds. 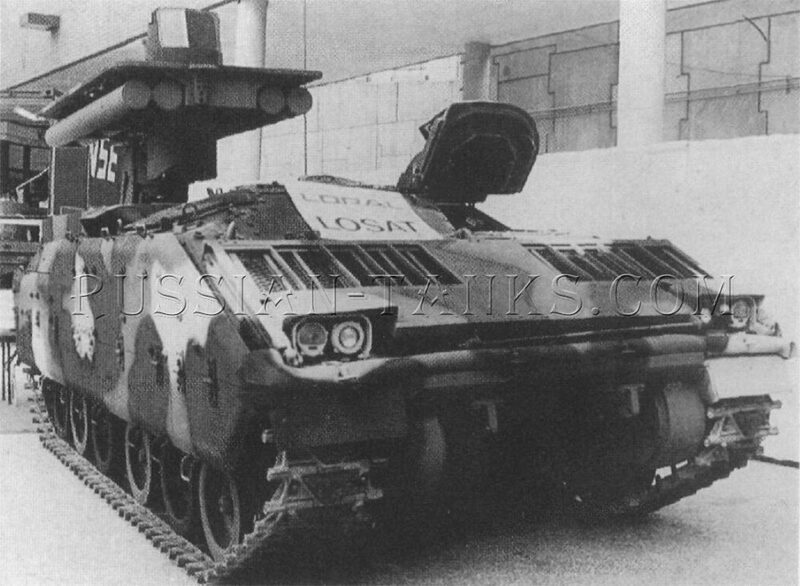 Installed in a four missile retractable launcher on the Bradley chassis vehicle, it was referred to as the line of sight antitank (LOSAT) weapon system. The forward looking infrared (FLIR) sensor was mounted on top of the launcher. 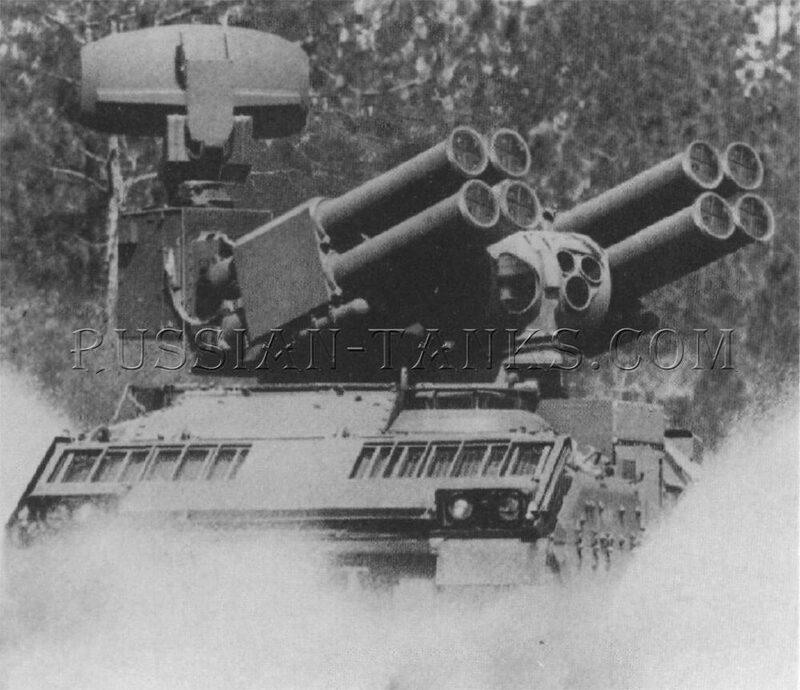 Manned by a crew of three, the LOSAT was intended to replace the TOW missile launcher vehicles in the army antitank units. 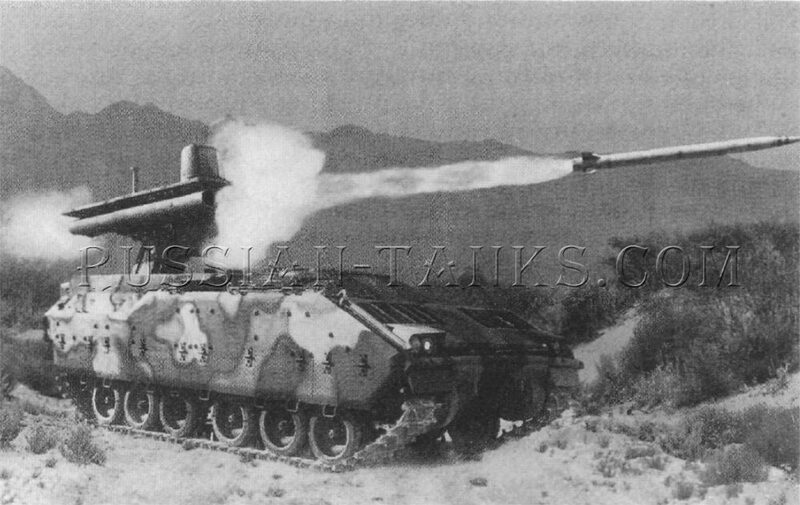 A combined antitank, antiaircraft weapon system also was installed on the Bradley chassis vehicle. 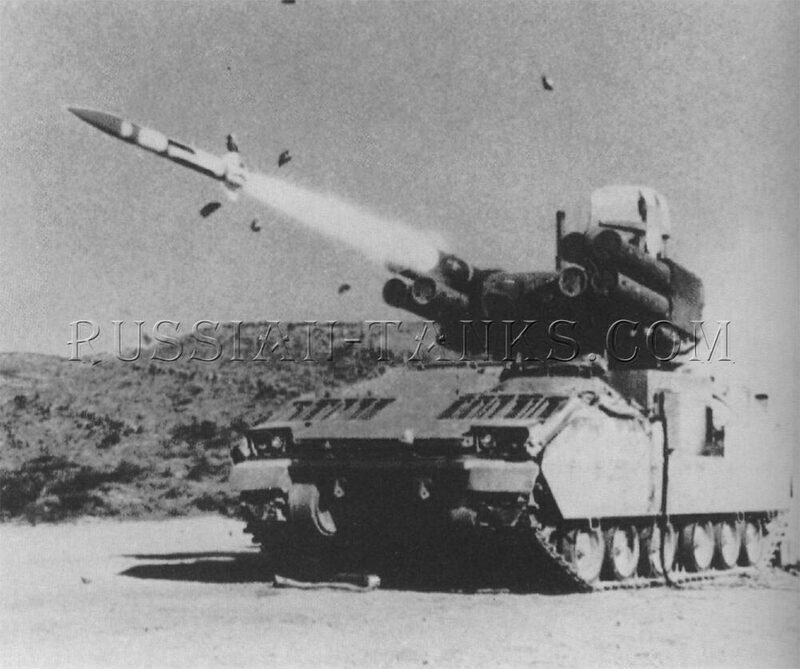 After termination of the Sergeant York program, the air defense/ antitank system (ADATS) was selected to meet the requirement of the forward area air defense system (FAADS) for a line of sight-forward-heavy (LOS-F-H) weapon. 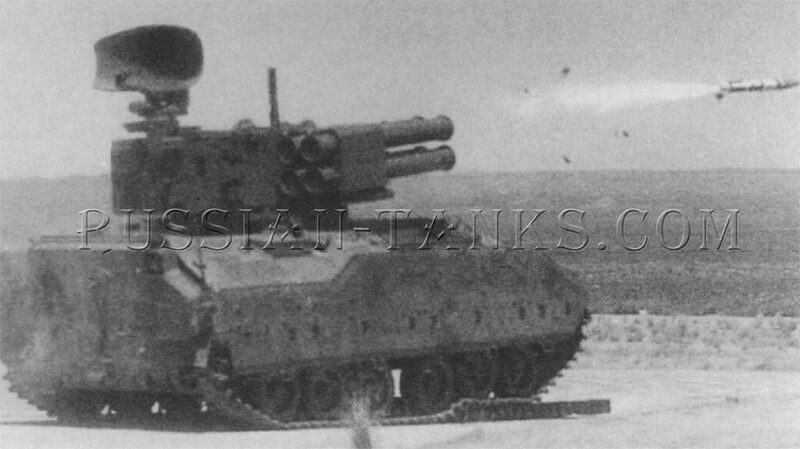 The ADATS, produced by Oerlikon-Buehrle, also was mounted on the Ml 13 series chassis and is described in that section. 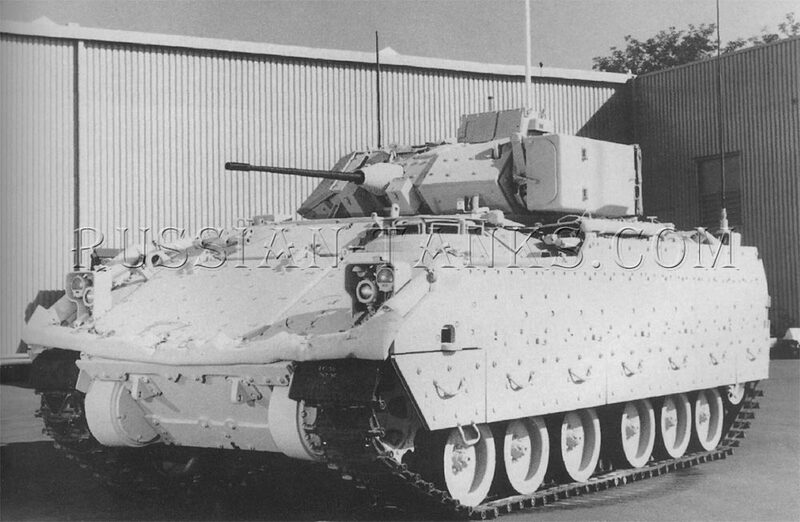 On the Bradley chassis vehicle, four missile launchers were installed on each side of a new turret which could be armed with an M242 25mm cannon. A radar antenna was mounted on the rear of the turret. Although the ADATS was equipped with a radar system for volume searching and could track ten targets simultaneously, its primary electro-optical fire control equipment consisted of a forward looking infrared target acquisition and tracking system, laser beam riding missile guidance, and laser ranging. As such, it was virtually immune to electronic countermeasures and antiradar missiles. Although the initial tests of the ADATS were promising, later evaluations revealed a number of reliability problems. That, combined with a reduction in available funds, resulted in the termination of the Bradley ADATS program (U.S. Army). 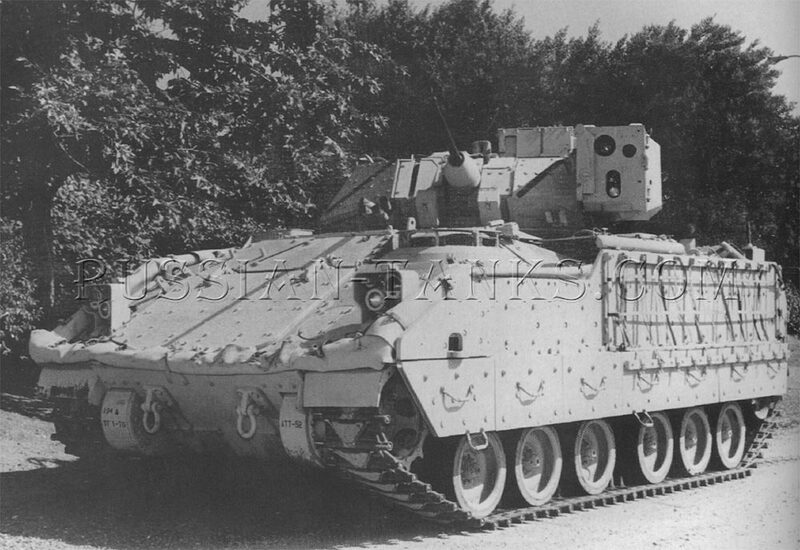 Another antiaircraft weapon based upon the Bradley chassis vehicle was the tracked Rapier. It participated in the original competition that selected the ADATS.